The recent Aero India show has underlined the special nature of India-Russia defence relations, which can be described as “borderless” in so far as the two countries enjoy a high level of strategic trust and jointly collaborate in making high-tech weaponry. There is a lot of debate around Rafale, the French fighter aircraft. Some analysts would argue that Rafale would bea better match for the Indian Air Force. But that may not be the case. The IAF chief has pointed out that though India is interested in having Medium Multi Role Combat Aircraft (MMRCA), Rafale can’t be a replacement of Sukhoi-30 as both possess different capabilities. Though the Rafale deal has been on the card for the last three years, there has been no finalisation on it as India and France have developed differences, particularly on the issues of the cost escalation and transfer of technology. India’s defence ministry will likely take a decision on Rafale next month, and so far there has not been any green signal that the deal will go through. 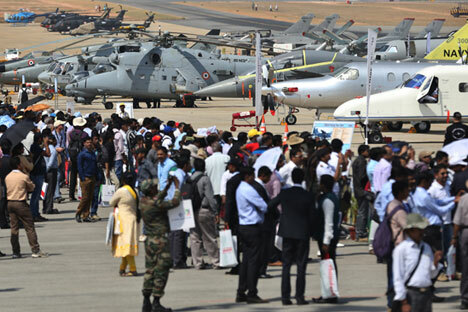 Russian companies participating in the Aero-2015 exhibition vigorously backed the Indian government’s ‘Make in India’ policy in strengthening indigenous defence industry. The head of Russian United Aircraft Corporation (UAC), Yuri Slyusar,struck an upbeat note about the prospects of India and Russia jointly manufacturing the engine for the Su-30MKI, the major fighter aircraft of the IAF. Russia’s arms establishment appears to have taken note of the changing world, in which there many defence suppliers have emerged. The new players have attempted to woo India’s market and benefit from the country’s fast growing economy. Russia appears to be ready to play in this new format. Kladov stressed this changing reality by arguing that Russia has no problem in India buying from other suppliers. Unlike the Cold War years when India was considered a minnow in international politics, the post-cold war India has grown rapidly with its economy crossing $2 trillion. India’s robust economy and its rise in purchasing power can suitably match its security and defence needs. Russia is not only India’s major arms supplier, but also its traditional partner. As the developments during the Aero India 2015 showed, the India-Russia defence partnership looks set to be strengthened in the months to come.